When a mysterious visitor comes to Absalom Station selling items belonging to a lost Starfinder, the Starfinder Society takes note. The PCs are dispatched to discover out how the recent arrival found these items, leading them on a series of quests beyond the Pact Worlds and into the stars. 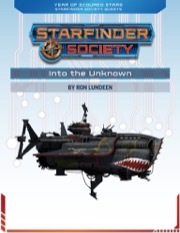 “Into the Unknown” includes five, 1-hour adventures that take the PCs from exploring Absalom Station, to partaking in starship combat, to exploring an alien world. The fifth adventure in the series provides a stunning conclusion that takes the PC’s previous accomplishments into account for a climactic final showdown against an enemy starship. Is this game still a go? I have not received any info by email yet. Nevermind, I did get an email, I just overlooked it. Thank you.